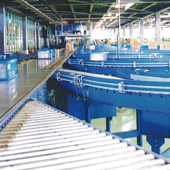 Tsubaki NaviSort is a high-speed sorting system that employs a slide shoe. This particular slide shoe-style system is unique in that it is powered by a linear motor drive, allowing for easy maintenance. Cases, foldable containers, postal packages, etc.